Lauren, rear-facing in the Britax Marathon at 2 years, 8 months. Lauren weighs 27 lbs and is 34.5 inches tall. 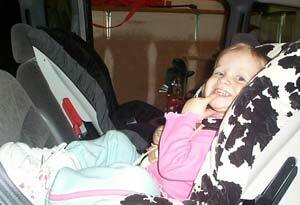 Lauren was rear-facing in a Britax Roundabout until age 2, when she was turned forward-facing. She turned back rear-facing in the Britax Marathon.